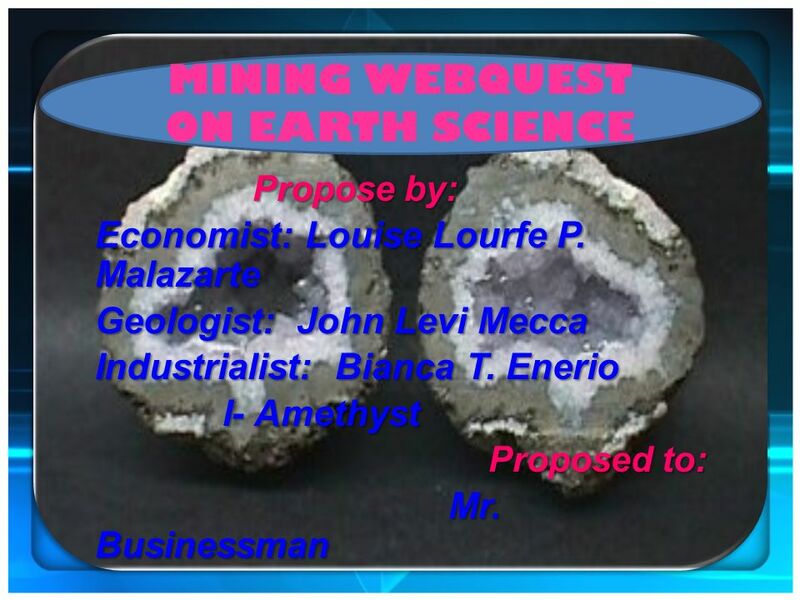 MINING WEBQUEST ON EARTH SCIENCE Propose by: Economist: Louise Lourfe P. Malazarte Geologist: John Levi Mecca Industrialist: Bianca T. Enerio I- Amethyst. 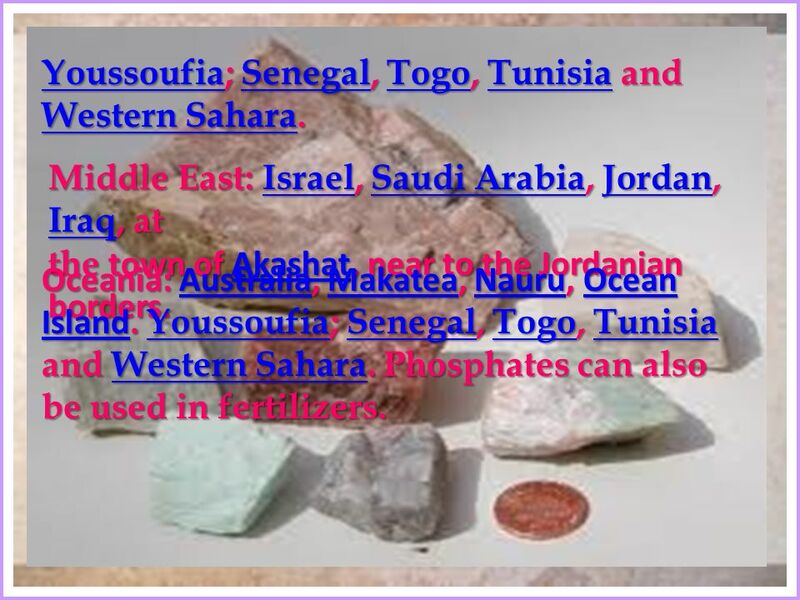 7 The demand for phosphate is increasing. 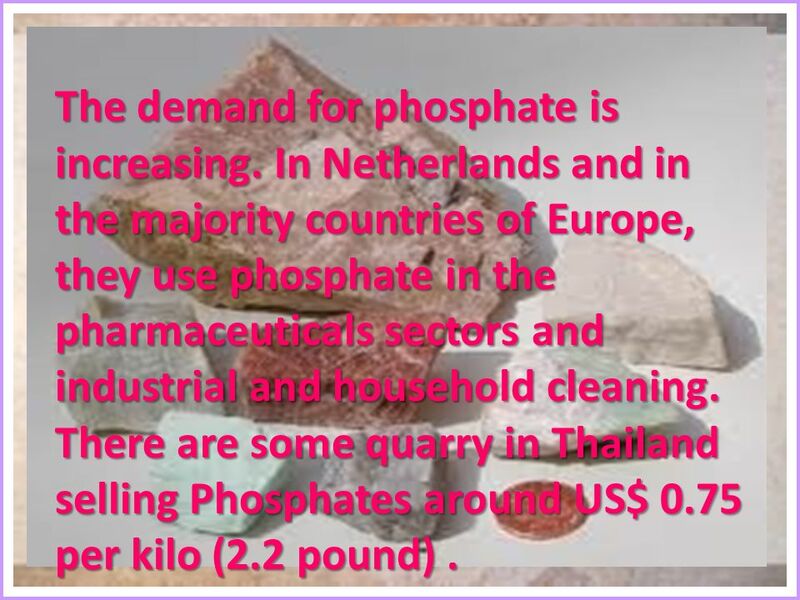 In Netherlands and in the majority countries of Europe, they use phosphate in the pharmaceuticals sectors and industrial and household cleaning. There are some quarry in Thailand selling Phosphates around US$ 0.75 per kilo (2.2 pound). 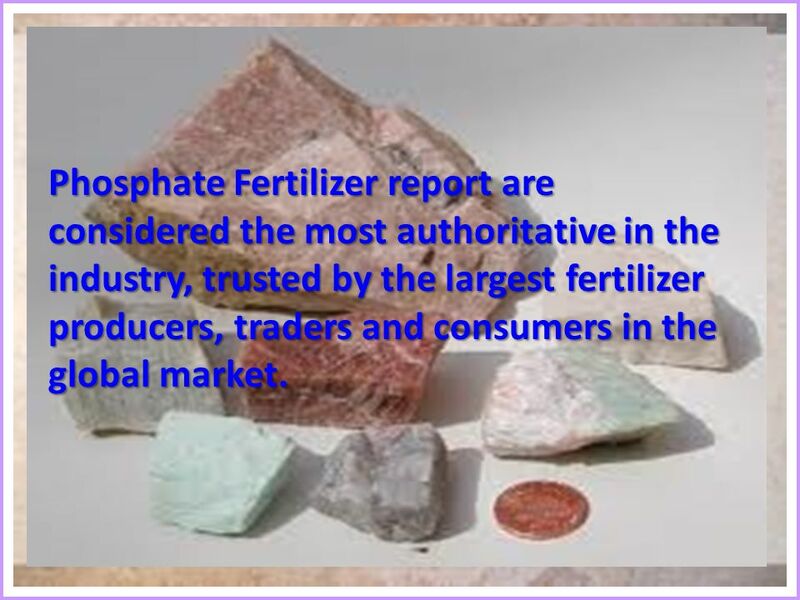 8 Phosphate Fertilizer report are considered the most authoritative in the industry, trusted by the largest fertilizer producers, traders and consumers in the global market. 13 . Phosphoric acid-based chemical polishes are used primarily to chemically polish (brighten) aluminum and aluminum alloys.. Phosphoric acid-based chemical polishes are used primarily to chemically polish (brighten) aluminum and aluminum alloys. 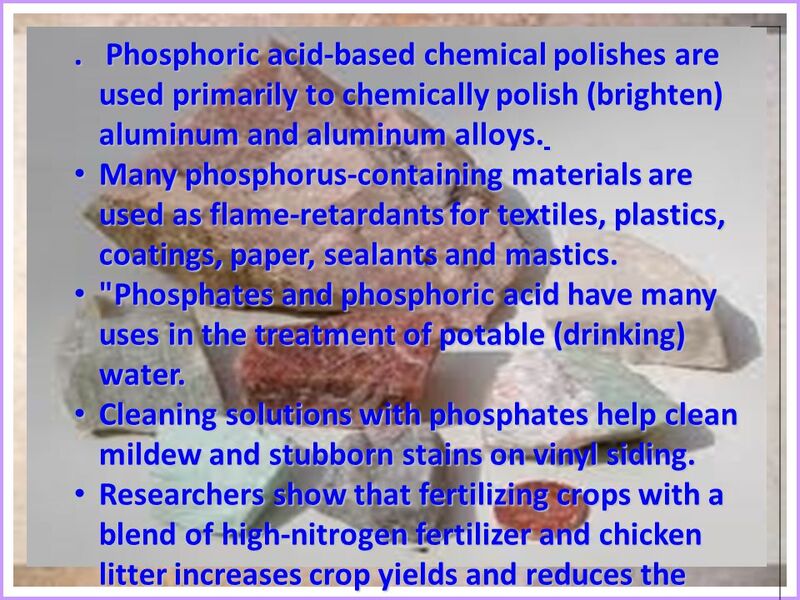 Many phosphorus-containing materials are used as flame-retardants for textiles, plastics, coatings, paper, sealants and mastics. Many phosphorus-containing materials are used as flame-retardants for textiles, plastics, coatings, paper, sealants and mastics. "Phosphates and phosphoric acid have many uses in the treatment of potable (drinking) water. "Phosphates and phosphoric acid have many uses in the treatment of potable (drinking) water. Cleaning solutions with phosphates help clean mildew and stubborn stains on vinyl siding. Cleaning solutions with phosphates help clean mildew and stubborn stains on vinyl siding. Researchers show that fertilizing crops with a blend of high-nitrogen fertilizer and chicken litter increases crop yields and reduces the potential for phosphorus runoff. Researchers show that fertilizing crops with a blend of high-nitrogen fertilizer and chicken litter increases crop yields and reduces the potential for phosphorus runoff. 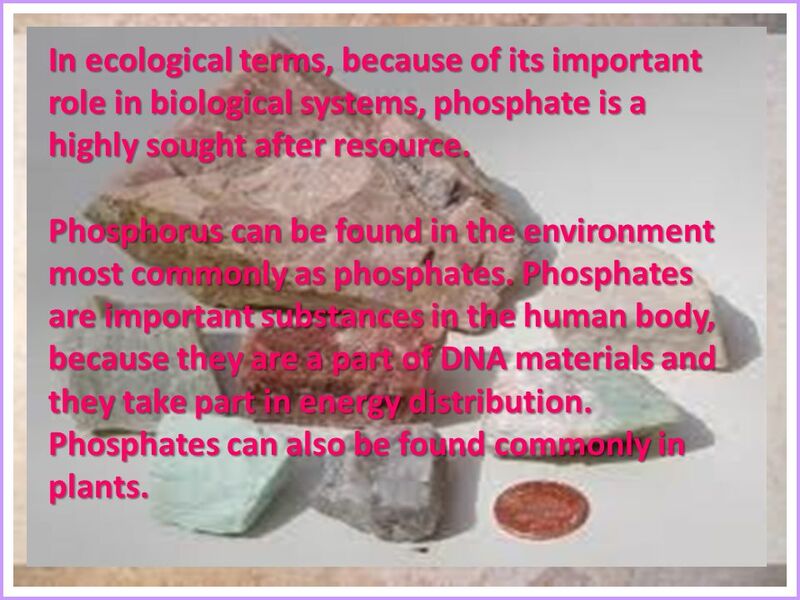 15 In ecological terms, because of its important role in biological systems, phosphate is a highly sought after resource. 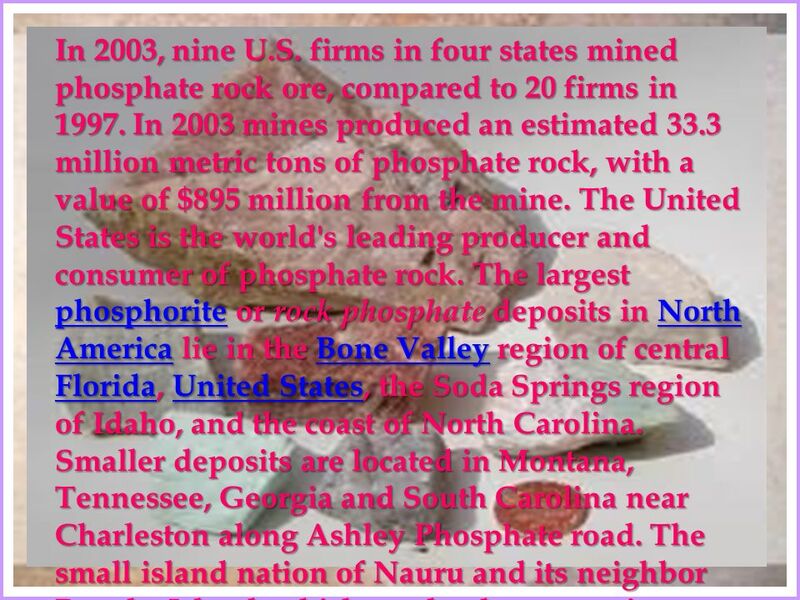 Phosphorus can be found in the environment most commonly as phosphates. Phosphates are important substances in the human body, because they are a part of DNA materials and they take part in energy distribution. Phosphates can also be found commonly in plants. 16 Phosphate is a dietary requirement, the recommended intake is 800 mg/day, a normal diet provides between 1000 and 2000 mg/day, depending on the extent to which phosphate rich foods are consumed. 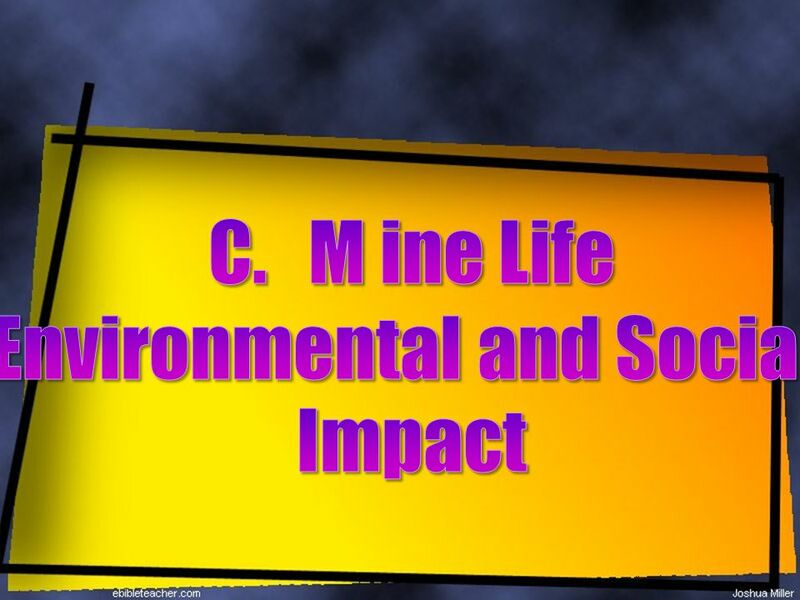 Humans have changed the natural phosphate supply radically by addition of phosphate-rich manures to the soil and by the use of phosphate-containing detergents. 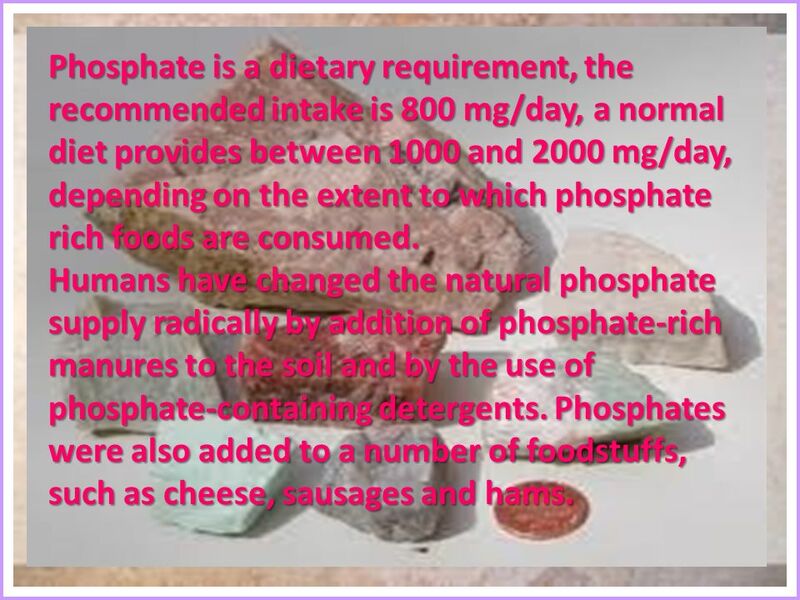 Phosphates were also added to a number of foodstuffs, such as cheese, sausages and hams. 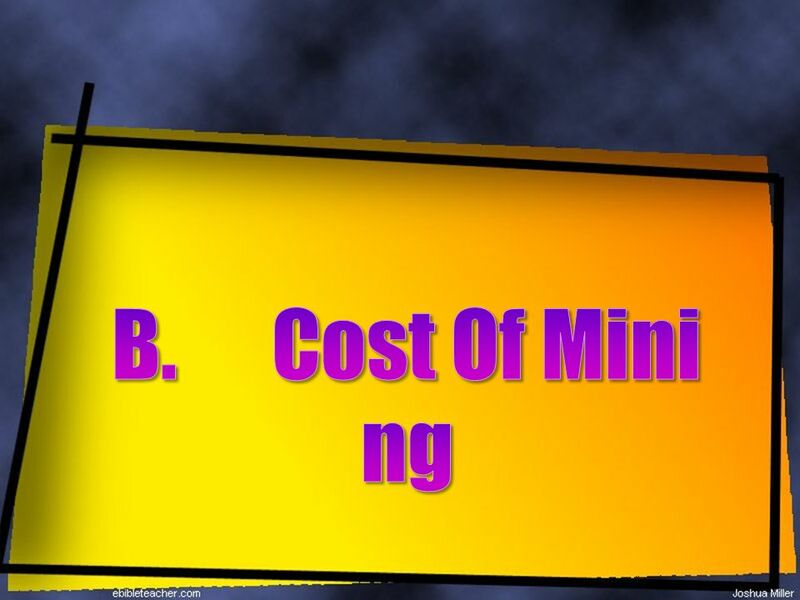 Download ppt "MINING WEBQUEST ON EARTH SCIENCE Propose by: Economist: Louise Lourfe P. Malazarte Geologist: John Levi Mecca Industrialist: Bianca T. Enerio I- Amethyst." Seth Clark Leyson Julia Louise Baliog Groupmates Kriz Sandra Temajo MS. Chaity Mulig 1-Amethyst. Which hemisphere is South Carolina in? A Comparative Study A Comparative Study. 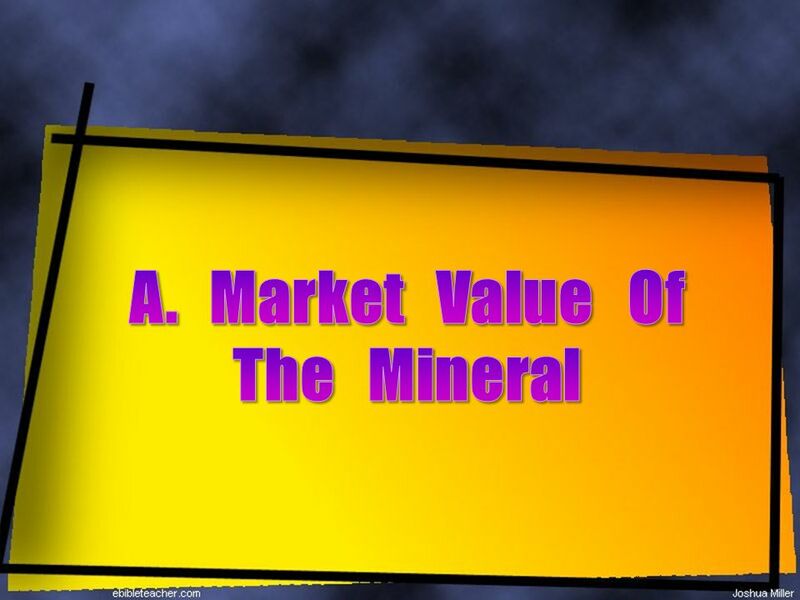 Manganese Mining Phosphate Mining Coal Mining.  This element is a silvery grey color.  Tin has no magnetism, so it is not magnetic.  It is in a solid state.  Tin is. Jonathan Walters Sector Manager, Energy and Transport Middle East and North Africa World Bank. THE PHOSPHORUS CYCLE. WHAT IS THE PHOSPHORUS CYCLE? 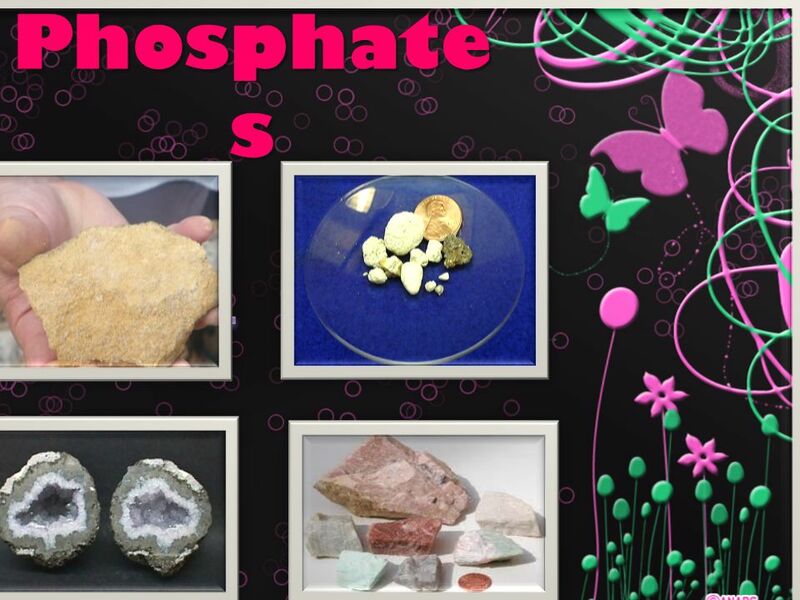  The phosphorus cycle, is the circulation of phosphorous among the rocks, soils, water, and plants. Phosphorus. 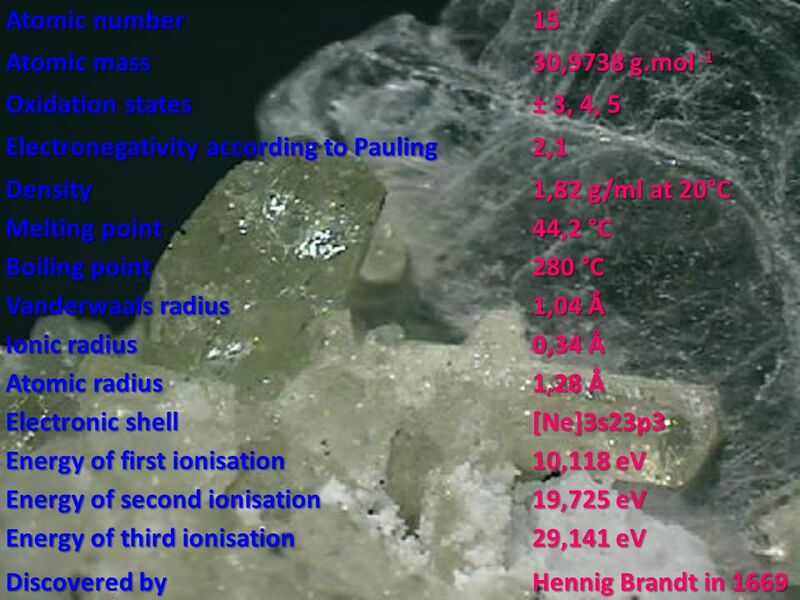 P Phosphorus was found in I It was discovered by a German alchemist named Hennig Brandt. It is never found free in nature. White phosphorus. 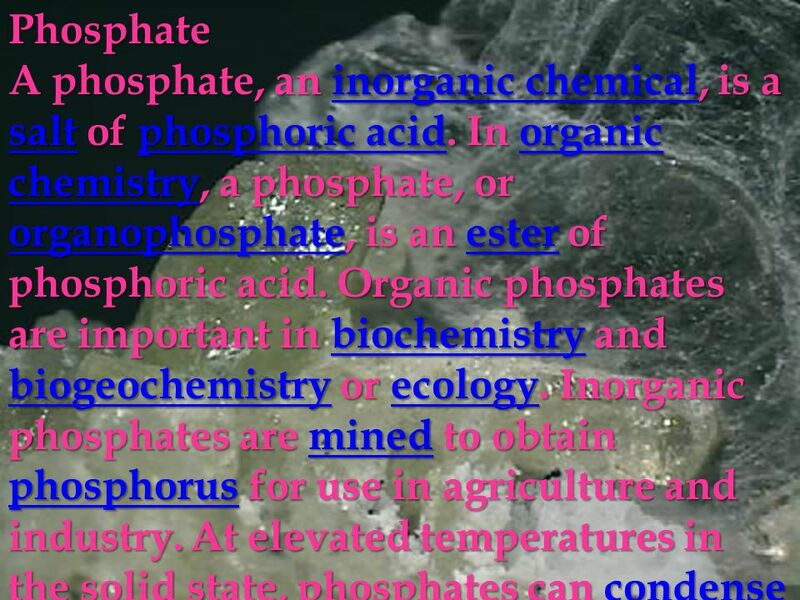 Phosphates A phosphate, an inorganic chemical, is a salt of phosphoric acid. In organic chemistry, a phosphate, or organophosphate, is an ester of phosphoric. Phosphates CE Lab. What is Phosphate Phosphate is a salt of phosphoric acid. 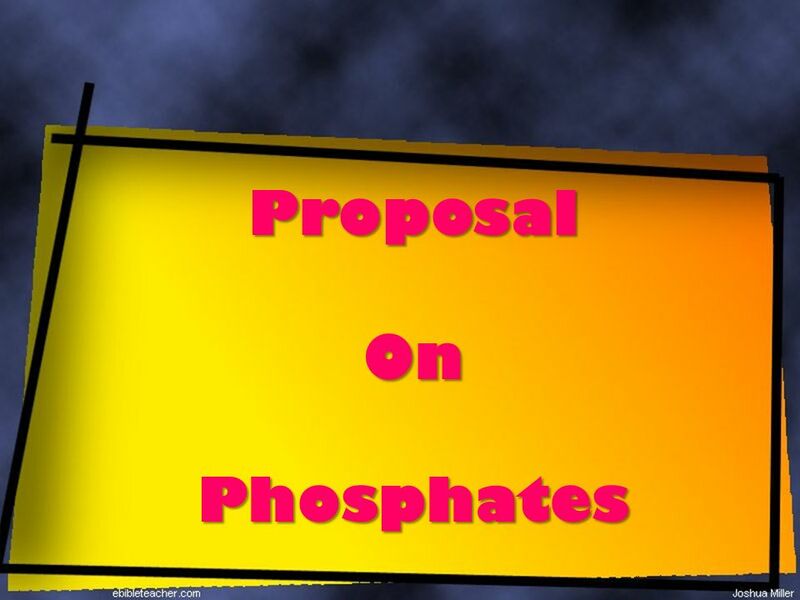 Phosphates are also important in biochemistry and biogeochemistry. Company Products- MAP. Company Products - Potash Potash denotes a variety of mined and manufactured salts, all containing the element potassium in water-soluble. The large land areas are called continents. There are seven continents.